At Zhone's new 17-acre campus in Oakland, CA, only 15,000 sq ft is dedicated to a manufacturing shop floor. "Our manufacturing strategy is based on outsourcing", says Ebrahim Abbasi, vice president of manufacturing. "Once a new product is introduced and stabilized, and all relevant manufacturing and test strategies for high volume production are developed, then volume production is outsourced to contract manufacturing partners. Outsourcing allows us to focus on our core competencies. So we do not need a large manufacturing space," he explains. Determining how to build products in volume can be complex, however. "Our production and test processes vary due to a wide variation of our product family," says Gary Saltis, director of advanced manufacturing. "Due to this variation, our products don't follow a fixed process by simply going from A to B to C and then on to D in our facility." Instead, Zhone requires a high degree of flexibility in routing different networking system products to the right work stations and to the right testing equipment in the Oakland facility. Yet, with a materials handling system now in place and flexible routing achieved, the company is well on its way toward meeting those tall expectations. Zhone occupied its Oakland facility just last August. Within the available space there, the company installed a combination of roller conveyors, pop-up ball table transfers, a hydraulic lift table, lift assist carts, and a sortation transfer vehicle (STV) system with guidance from FloStor Engineering. Small also characterizes the STV part of the handling system. A single vehicle, which was customized for Zhone's purposes, runs back and forth over a straight stretch of track only 72 ft long. Equipped with a roller conveyor deck, the STV delivers configured systems to work station test cells and later moves them on to their next destination. Several different methods for these delivery and takeaway steps were evaluated. They included relying on totally manual delivery with carts and installing parallel conveyors acting as a handling system spine for delivery and takeaway. Zhone also considered STV routing and chose this approach. "Based on past experiences with similar applications using conveyor based delivery systems, we determined that an STV would better accommodate the spikes in our production volume and eliminate the inherent bottlenecks common with conveyors," says John Friedl, senior manufacturing engineer. This STV system also provides, he adds, "more robust routing of our configured products by handling all transactions through software control." Thus, there's no need for bar code scanners or similar automatic data capture methods for tracking the location of work-in-process. The STV carries only a single load and this system's software then monitors what's aboard specifically, where it goes in the facility, and when transactions take place. "We pull our products through the manufacturability and testing process," says Friedl. "We also want to avoid having our test technicians waiting for the next configured networking system to arrive." In addition, Zhone doesn't want products waiting long in a test cell before a technician gets to them. These were key requirements for a handling system intended to provide high throughput, Friedl explains. Configuration of networking products to be tested. STV shuttle delivery of these products to test cells. Within the configuration area, printed circuit boards (PCBs) are inserted into an empty networking system chassis. That chassis arrives at Zhone bolted to a wooden pallet that serves not only as a shipping carrier, but as a conveyance pallet as well, Friedl explains. Currently, the facility uses 24 in. x 24 in. pallets, but can handle up to 30 in. x 30 in. pallets. This area uses a long ball table capable of holding up to 12 units at one time. The ball table design allows operators to insert PCBs into either the front or the rear of the chassis quickly and easily. Operators readily have access to all sides of the chassis. Pneumatic brakes prevent the chas-sis/system from moving while PCBs are being secured. After completion of the configuration process, systems are manually routed down one of two configurable staging conveyors. From this staging area, chassis/sys-tem units ready for testing are called to one of five system test cells and delivered by the STV. 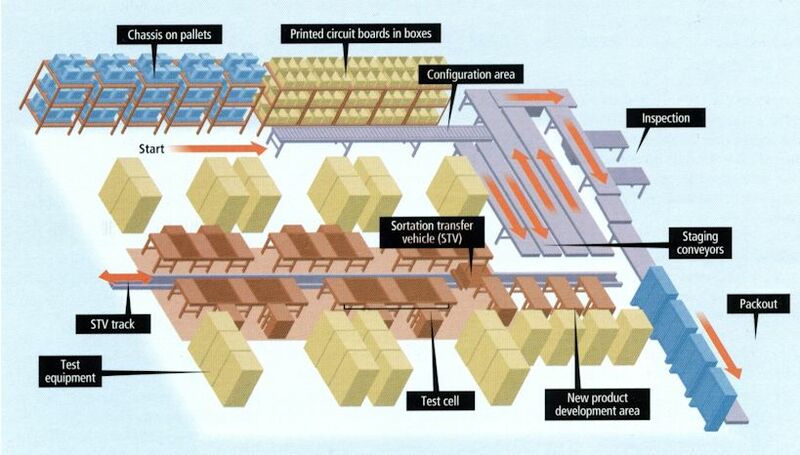 Each cell has a dedicated input conveyor, two test positions, and two dedicated output conveyors. The handling system design allows units to be called from any output conveyor in the system and to enter the next cell in the process at the input conveyor. Once within a test cell, a chassis/system unit is manually routed to an available test position. After a unit has passed testing, it is pushed onto the output conveyor for routing to any input conveyor in the system. All routings are manually input to the system with programmable push buttons mounted on each input/output conveyor. "This cell design eliminates the common bottlenecks found with conveyor systems by allowing units to be routed to subsequent destinations only if that destination is available," Friedl says. "In other words, the STV pulls units through the system test process and does not allow units to be pushed." New products that require customized routings are sent to and from a dedicated area consisting of four bidirectional conveyors. These conveyors act as both inputs and outputs. They allow units to be routed to any other input or output conveyor in the system. This allows units with unique testing requirements to access any test cell. After units have completed testing, they are then routed to an area where they undergo an extended testing period or are routed to final inspection. After inspection, systems are sent directly to packout where they are boxed and readied for shipment. This semi-automated handling system was completing a final debug phase late last year. But thus far the system has provided many benefits, even some not realized before system implementation, Friedl says. For one thing, ergonomics has improved significantly. Test technicians no longer handle manually units weighing more than 100 lb. Lift assist carts, a lift table, and transport by either STV or conveyors take over the heavy lifting and moving steps. Material flow through the facility is improved, moreover, says Friedl. The factory floor also is more organized now. 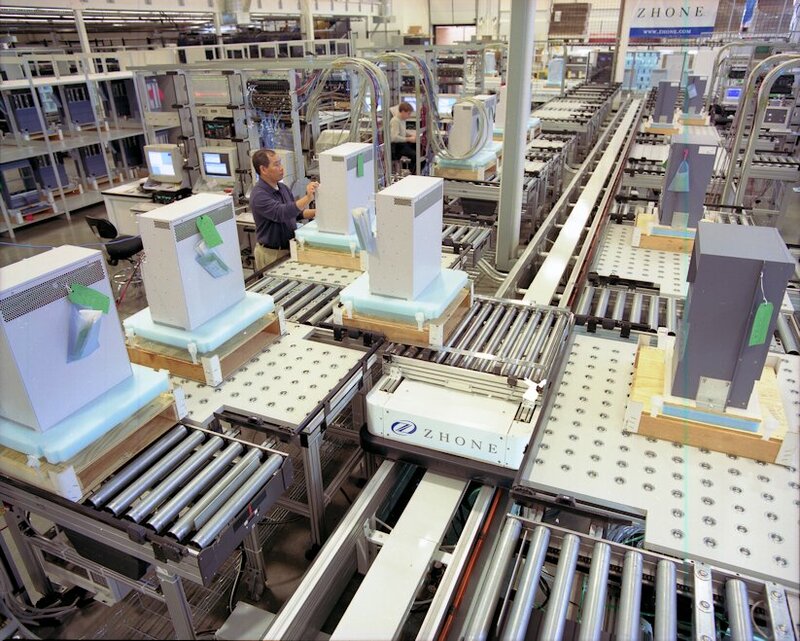 Routing of units is more precise than before when Zhone used carts, manually pushed by technicians, to hold work-in-process. With fewer carts on the floor, too, there's more space available for test equipment. Friedl also notes how he and other Zhone managers can go out on the floor or use their software controls and readily get visual indications of the status of the factory. They can find where work-in-process is in dedicated work stations or in the new product development area, for example. Floor space, limited though it may be, is better utilized now, moreover. From all indications, thinking small, but with flexibility and efficiency when it comes to materials handling, works well for achieving Zhone's big goals in a high-tech, evermore-networked digital world. This handling system has exceeded our capacity expectations throughout a rigorous test and evaluation period. Handling time by technicians is greatly reduced, and there's increased efficiency in testing procedures.